I’m spending some time decompressing from CleanMed 2012 earlier this week; reflecting on what I learned, who I met, what I saw and how it changed me. From what I could tell, the conference was yet another rousing success. Attendance was high and everyone there was extremely engaged, passionate and knowledgeable. That’s great news for an industry that has such a big impact on the environment. I was still suffering from a 2011 Aspen Environment Forum hangover, which distorted my view a bit. I found myself constantly comparing CleanMed to the Aspen Environment Forum, which is completely unfair and misguided. They are two totally different animals geared towards achieving very different objectives. At the Aspen Environment Form, nearly every session and subsequent conversation was really high-level, which is to say the focus was more about theories and ideas and less about strategies and actions. That’s not to say there weren’t tangible takeaways from Aspen. There were, but I found myself thinking about ideas that were pretty tough to wrap your head around: how can and will the earth’s population growth impact our lives, or why Gross Domestic Product is a bad measure of how our economy grows and what a new, better metric should include. It was big, heady stuff, and in most cases I couldn’t necessarily put much to use right away. I loved it nevertheless and hope to get back there soon…it’s Aspen, after all! CleanMed, on the other hand, seemed to focus on two things: implementation and networking. Sessions (at least those that I attended) zeroed in on what healthcare facilities should be doing and how they should be doing it. Topics ran the gamut and included such concepts as greening the operating room, reducing water consumption, composting, safer chemicals, energy conservation, employee engagement, etc. etc. A lot was covered, and it was the brass tacks of greening a hospital. I found myself taking copious notes on many tried and true strategies for success. It was, in most cases, really rich content that is immediately applicable in our work. The other focus was networking. During the two and a half days, over nine hours wasn’t “programmed”. Such an approach allowed attendees to dive a bit deeper in their conversations. We were able to share stories about what was working, what wasn’t, and generally kick around ideas about how to be more effective in our work. Every time I spoke with another someone, the conversation was always meaningful and illuminating. Time after time, I was impressed with everyone I talked with, regardless of where they were from or what their job title was. One theme came up time and time again: sustainability initiatives align with their nearly every organization’s mission to improve health. Many unintended consequences of running a healthcare facility negatively effect human health. To name just a few (and there are many): air pollution, food insecurity, aggravated pre-existing conditions, increases in infectious diseases, obesity, and death. Yes, even death. There are clear connections to all of them, and it was refreshing to hear so many healthcare professionals not only acknowledging those connections, but also strategizing about how to lessen their negative impacts. One shining example was Jeffrey Thompson, CEO of Gundersen Lutheran in La Crosse, Wisconsin. I was thoroughly impressed with his vision and tenacity for greening their hospital. The sessions that drew the most attention were typically focused in some way on reducing energy consumption. This is no surprise given the industry’s operational requirements (you can’t exactly send everyone home at 5pm and shut everything down). Hospitals have more than 2.5 times the energy intensity and carbon dioxide emissions of commercial office buildings, and the EPA estimates that a $1 savings in a hospital’s annual energy costs equates to an increase of $20 in annual revenue, based on a 5 percent net operating margin. Not a bad exchange rate. Further underscoring the importance of energy efficiency, energy costs are going nowhere but up, which presents a significant risk to a hospital’s bottom-line. And oh, by the way, the majority of the energy being purchased is emitting some pretty unhealthy stuff, which is contrary to the mission of these facilities (see takeaway #1). The good news is that there are so many opportunities to conserve energy, and many of them require no investment whatsoever. 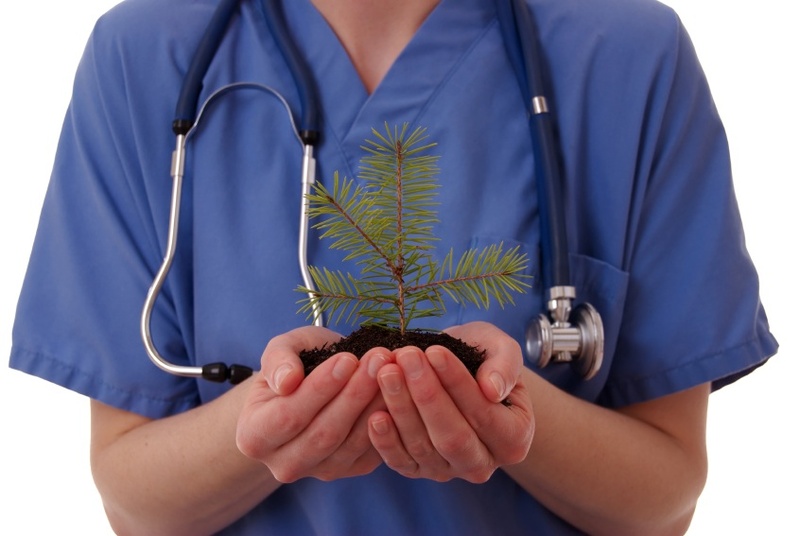 The differences between where hospitals are in their sustainability journey is pretty stark. I met several people who were just getting their initiatives off the ground while others had been taking strides for several years. The greenhorns were busy developing strategic plans and picking low-hanging fruit while the green experts were contemplating the installation of a co-generation plant onsite. Despite the varied levels of experience, everyone felt there was more to do in their institution. When it was all said and done, I was really glad that I went. I have fifteen pages of notes that either reinforce what we’re already doing or are full of new ideas, new strategies and new approaches to greening the industry. I’m really excited to sit down with our friends at The Nebraska Medical Center (and anyone else in the industry that’s interested) to talk about where they want to go next. The healthcare industry is in flux right now (for a variety of reasons). As it evolves into its new state of being, it’s clear that many in the industry are looking at sustainability as a means by which to achieve their organizational objectives. The connections are clear, the mission-imperative is there, and the business case is rock solid. Which makes me wonder, if you’re a leader and decision-maker in the healthcare industry and you’re not seriously contemplating how to take advantage of the opportunity, what are you waiting for?